No, this isn’t a post about how Facebook are stealing your images and selling them for vast sums of money. No, I’m not going to suggest that you copy and paste this blog onto your Facebook and tell others to as well (but feel free to share it there). … but, Facebook is costing you money. And if you’re an iPhone user, especially a heavy social media manager like me, then you may be surprised at how much it’s costing you. Back in the summer a friend of mine was away with work. Because of his location and a very poor hotel he was away from life’s most important component (if you’re a social media-savy geek) – WiFi! For a whole three days, Jack had to rely on just 3G. Jack likes Facebook and Jack checks Facebook quite a lot. He’s not obsessed, but he does like checking up on family and friends in between working hard and commuting. But within three days, Jack had exhausted his data allowance and was left with no choice but to buy more. Data isn’t free and in just three days he’d somehow managed to use up a month’s worth of data. Wow, what had he been doing on his iPhone? I decided to look into it further. It all got a bit busy and I forgot all about it at the time, but I was pondering on it over the weekend. If you go into your iPhone settings on iOS8 you’ll find celluar or mobile (depending on your provider). If you click it, as I did, you’ll find you can turn off your data (which you should when roaming abroad) and also enable 4G and turn on your Personal Hotspot. But by scrolling further you’ll find the ‘Use Cellular Data For’ section. 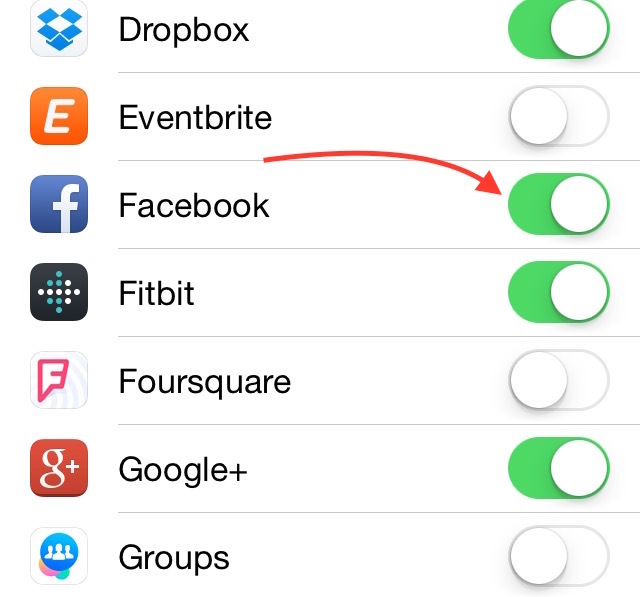 Here you can turn off certain apps to stop them using your data while you’re out – limiting them to WiFi only. Next to each app you’ll see a number. That number tells you how much data your iPhone apps are using on your mobile network. If you’re on a package then you’ll want to look here. 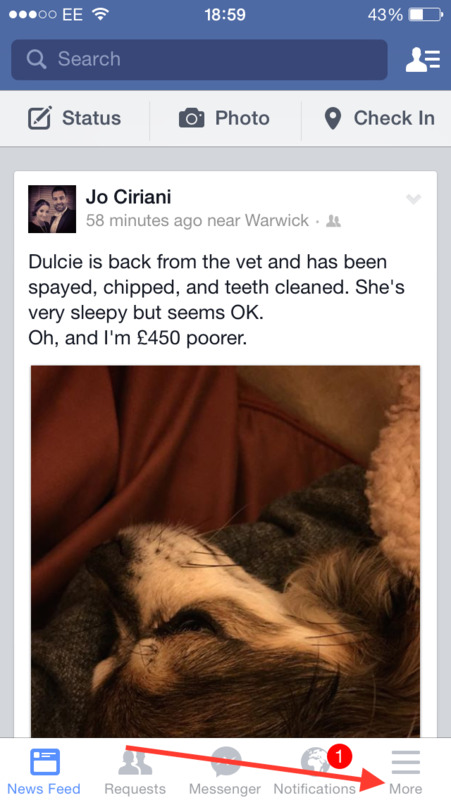 What I found on my iPhone and Jo’s iPhone is that Facebook was by far the king of data. It was using way more than the iPhoto app, Music, iMessage and all our other favourite apps. Mail was the most hungry app – but we both have our email on push, making it use a lot of data as we share files, PDFs and documents with clients. So why? Why is Facebook using so much data and costing us money? Well Facebook is very visual. It’s all about faces right? Images have to been downloaded to your iPhone and when you’re out of WiFi range that means only one thing – it used your data. So images are hurting your data usage and pocket. Facebook is increasingly more video-led. Many more people are uploading video and of course funny cat videos are the staple diet of any Facebooker. Videos have a far greater amount of data and downloading those will eat away at your precious data package faster. So videos are using up all your data. Facebook introduced auto-play videos a while back and now when you’re scrolling through Facebook your videos start playing right away so you’re streaming videos without meaning to. Streaming costs data. Data costs money. Auto-play videos are costing you money. On the iOS8 software you also get ‘Background App Refresh’. This refreshes your apps when you’re not even using them and keeps them all up-to-date for when you get back. So Facebook videos and images are downloading when you’re not even on Facebook costing you data and money. I reset my data usage stats and went onto Facebook with my WiFi turned off. I looked around Facebook, scrolling down the page at the images and videos and replied to a few status updates. The images were all shown to me as I scrolled and the videos played silently, automatically, and I viewed a couple of them. I spent five minutes catching up and then went back to my usage screen. I’d used 37MB of data! This means that if I had a 2GB data package or 2048MB (the standard data package from most suppliers) I’d only have to spend 4.6 hours on Facebook to destroy my ENTIRE monthly data. The average user checks Facebook every day for 21 minutes, so after 13 days the average user would be out of data! That leaves you with the rest of the month with no data. You’d have no idea what your auntie had for breakfast! But you also have no emails or iMessages either! So Facebook is costing you money. Go to your iPhone now. 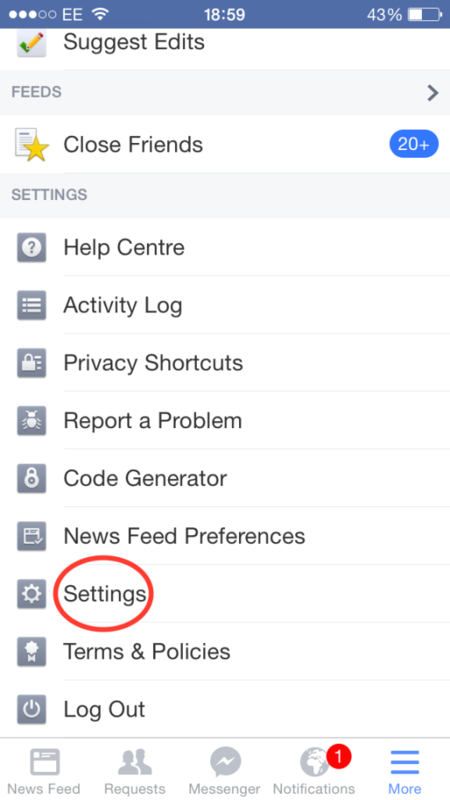 Go to Settings>General>Background App Refresh and turn off background app refresh… but do it for Facebook alone! If you only turn off Background App refreshing for everything, you’ll find that when you turn it back on for apps like sports or health apps that need it to run then Facebook will start eating your data again. Turn Facebook off and it stays off. Tip: Turn off Background App Refresh for all apps afterwards too. It’s a huge battery drainer and I’ve never found a reason to keep it on. 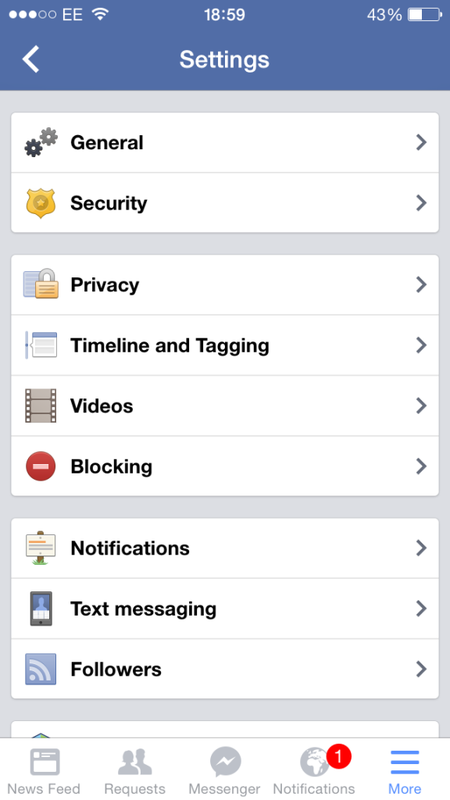 Now go to your Facebook App on your iPhone. You need to turn off the auto play videos (even if you’ve already done this on the desktop site, the App has separate settings and will override them). In the bottom righthand corner tap the ‘More’ tab. Now scroll down and tap the ‘Settings’ tab. 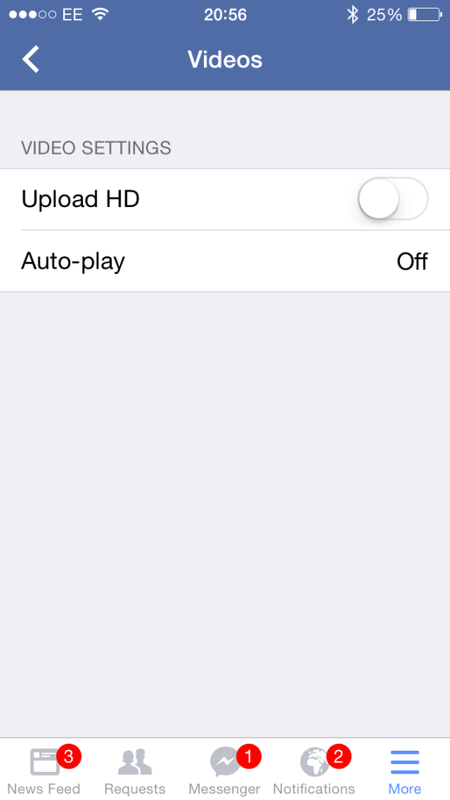 Then tap ‘Videos’ and turn auto-play to off. Now you can be safe that when you’re relying only on 3G or 4G that your iPhone won’t be a data hungry in the background and your Facebook usage will be better. But Facebook will still use data… just not as much. Images still use more data to download them and that’s why Twitter uses far less. This will save you a lot of battery power on celluar and WiFi though, as downloading video kills your battery. This all becomes even more annoying when you look through your Facebook and realise that you probably don’t click on even 50% of the videos but you’ve been paying for them in data and battery. I hope this helps. Go to your mobile or cellular usage now and let me know how much data your Facebook app has used since you last reset the usage. I’ll be keeping an eye on mine for a week to see how it goes. I had video autoplay set to wifi-only and was at 10 gb. You made a good point about the battery so I set it to completely off, because I’m almost always on wifi when checking FB and other apps. Thanks. Glad it helped, Aaron. Battery is another issue with many smartphone users and often these cool tricks just drain battery. I’ve done all that for Facebook but I have a Facebook Page for my business. I regularly publish videos there and they always play automatically on my iPhone 6. Is there any help for that? I can’t find how to do that but I agree that’s happening for me too! How very annoying and very Facebook. The only place I thought it might be was within the Pages App setting but I can’t find anything in the limited options there.